John Hall Archer was an accomplished historian and civil servant, and the first president of the University of Regina. Born on July 11, 1914, near Broadview, Archer was a teacher in Saskatchewan's rural districts from 1933 to 1940, and during World War II served with the Royal Canadian Artillery in the United Kingdom, North Africa and Italy. After the war, he earned BA and MA degrees in history from the University of Saskatchewan, and a BA in library science from McGill University. He served as Saskatchewan's legislative librarian (1951-64), assistant clerk of the Legislature (1956-61), and provincial archivist (1957-62). 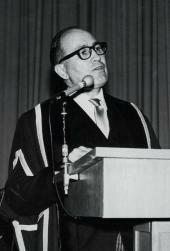 Archer became director of libraries at McGill University (1964-67), then archivist and associate professor of history at Queen's University, where he earned his PhD in history. He returned to his home province in 1970 as principal of the Regina campus of the University of Saskatchewan, and served as president of the University of Regina from its establishment as an independent institution in 1974 until his retirement in 1976. During and after his career he served on numerous Royal Commissions, boards and advisory councils, and was a prolific author and editor. His books include Land of Promise (1969), Saskatchewan: A History (1980), Honoured with the Burden (1987) and, as editor, One Canada (1975-78), the memoirs of John Diefenbaker. He received the Order of Canada and the Saskatchewan Order of Merit; the University of Regina's main library is named after him. John Archer passed away on April 5, 2004.